Specializing in the sugar industry in Louisiana. We service what we sell, as we have been doing since 1836. 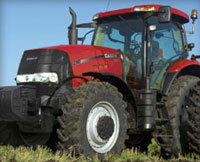 Lemann's is the second oldest CASE IH Dealer in North America, the oldest CASE IH Dealer in the South, and the largest AUSTOFT cane combine dealer in Louisiana. Kioti tractors, Kubota tractors, Tracker Marine bay boats, bass boats, utility vehicles, backhoes, and riding mowers can be found at Henderson Implement & Marine, with 3 locations in Southwest Louisiana.